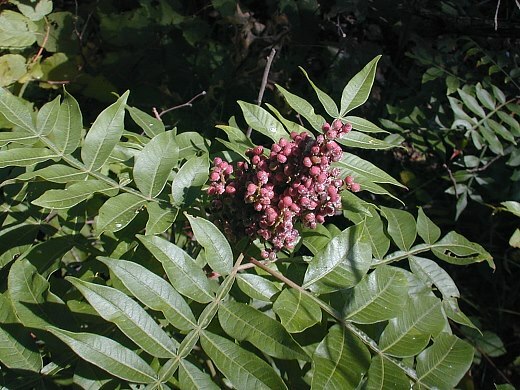 Rhus copallina.John Hilty.www.illinoiswildflowers.info. (Both Accessed 5/2014). Rhus copallina is a shrub or small tree to 6 m tall; colonial, often forming broad, domed mound-shaped colonies with smaller, younger stems on outer edges, sap milky-sticky, bark gray with darker lenticels, twigs finely hairy (Harlow 1946), stout but more slender than other Rhus sp., pith greenish-white. Leaves alternate, pinnate, to 35 cm long, leaflets 11-23, 3-8 cm long, pointed at both ends, entire or with a few teeth, midrib winged, wings to 0.4 cm wide (Yatskievych 2006). Autumn color red. Flowers tiny, greenish-white, visited by bumble bees and numerous other insects, sexes on separate plants (clones, dioecious); inflorescence about 15 cm long, terminal, dense; blooms July-Aug. (later than R. glabra). Fruit (female plants only) bright red, 1-seeded, velvety to 0.5 cm wide in dense conical heads, Sept.-Oct., very persistent. Seed load 62%. Pulp nutrients: water 26%, lipid 16%, protein 3%, CHO 3% (White 1989). Available for winter resident birds. Fruit eaten when other food unavailable. Habitat: Open areas in full sun, along roadsides, in nutrient-poor fill, sand, back dune scrubland, landfills, soil pH 5.3-7.5 (USDA, NRCS 2010). Tolerant of salt, drought. Intolerant of soil compaction, flooding, shade, index 0-2 (Hightshoe 1988; Grime 1965). A woody pioneer, quickly shaded out by taller species in developing woodlands. Notes: Twigs and bark eaten by deer and rabbits (Martin et al. 1951). 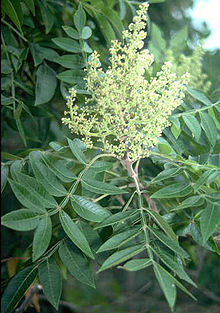 The most common of our three Rhus species. Stressed or wounded plants are susceptible to common, opportunistic fungal infections such as die back caused by Botryosphaeria dothidea (Ascomycotina). Sumacs are sometimes infected by a wilt caused by Fusarium oxysporum forma speciales rhois (Deuteromycotina, Hyphomycetes). Infection by Fusarium oxysporum causes leaves and young stems to become flaccid, light green then yellow, then to die. Cross section of infected stems shows a brown ring of infected vascular tissue. Fusarium is a soil dwelling fungus that infects plants through their roots. Roots wounded by parasitic nematodes are particularly susceptible. Sumac also may occasionally be infected by Nectria canker (Nectria galligena, Hypocreaceae; Ascomycotina) with red, bead-like fruiting bodies (Agrios 1988; Sinclair et al. 1987). Sumac is an alternate host to Pulvinaria innumerabilis, the cottony maple scale (Homoptera, Coccidae).